Fantastic one-way cruise from Omis (near Split) to Dubrovnik, including the beautiful island of Vis. Half-board meals and standard sightseeing walking tour package (6 walking tours) already included. Extra optional excursions available as well (see below). 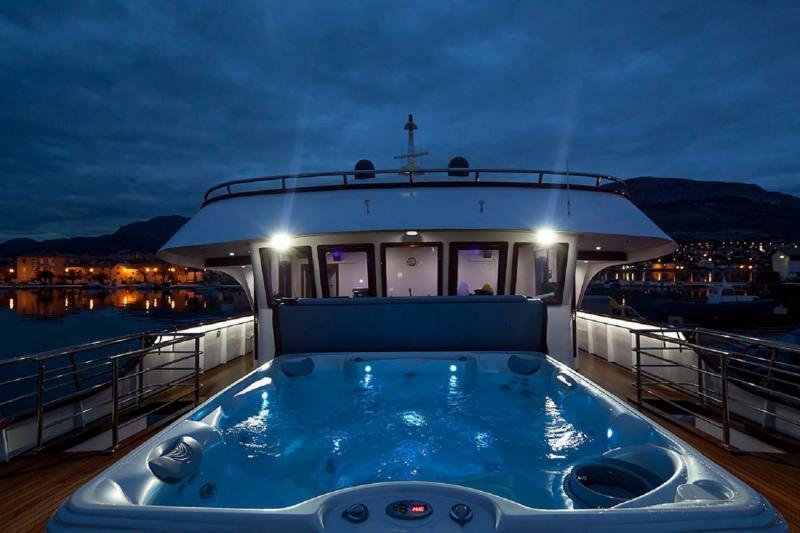 Adults only cruise, though usually clients are more couples, mature solo travellers or small groups ranging from 35-75yrs. Double/twin cabins on Main and Lower Deck on this ship. 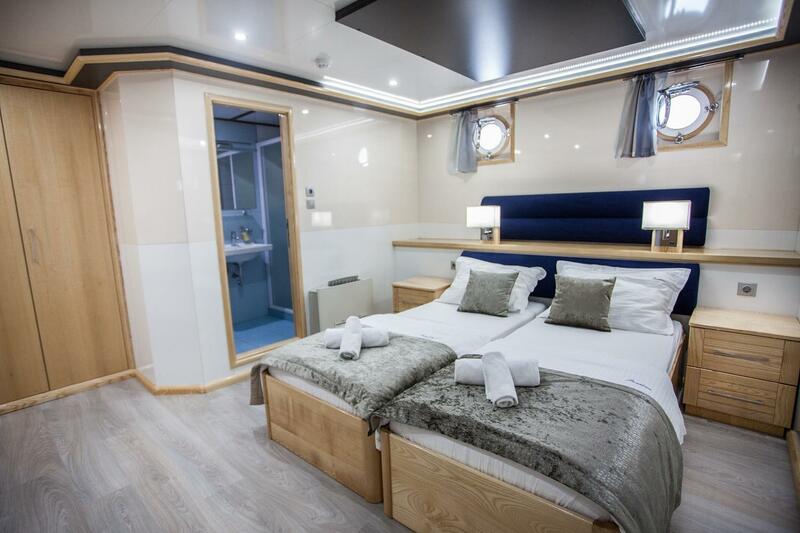 Triple cabins are a queen bed and single bed and all are on Lower Deck. Solo travellers must book a double/twin for solo use with a solo use supplement. Waking up to the dramatic backdrop of the charming town of Omiš will probably entice you to travel up the river Cetina and through its canyon in our optional tour. Later, you will be able to compare this bit of hinterland with the lovely island of Brač, the homeland of ‘the Croatian marble’. You’ve probably seen this ultra-quality limestone already, perhaps on the front of the White House in Washington DC or Bundestag in Berlin, but the optional tour to the still-operating stonemasonry school in Pučišća brings a chance to learn more about shaping this stone for eternity. 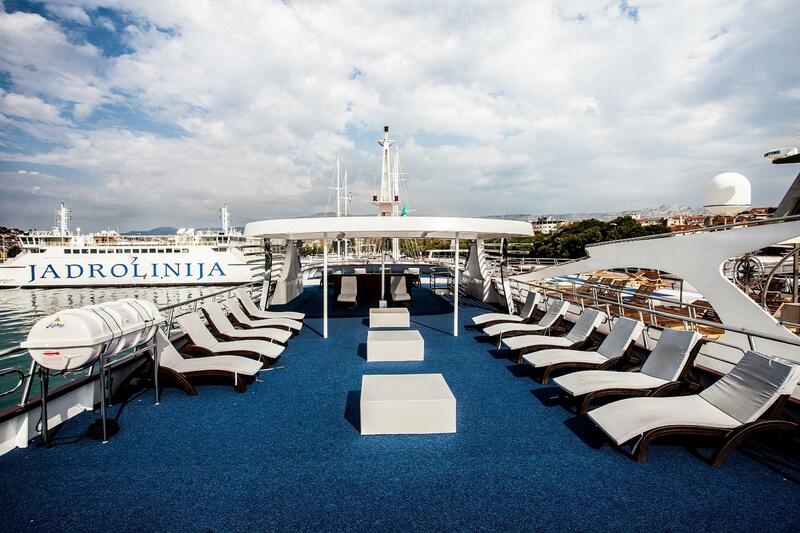 Once back to the mainland, stop in Split. Whether you explore on your own or join our optional walking tour, don’t miss the Palace of the Emperor Diocletian. Originally planned as his retirement estate, today it is the lively city center of Croatia’s second largest city. Whatever you do, make sure to take it easy in Split, as after all, that is the true highlight of local living here. Dinner on board and overnight in Split. When sailing along the Croatian coast, surpassing the beauty around you may seem like an impossible task. Perhaps so, but there are sites on the Croatian mainland which surely parallel it, such as the Krka River and its stunning estuary. A coach trip brings you to the small town of Skradin, the guardian of the mouth of River Krka, and the gateway to its National park. The place where wild waterfalls inspire serene lakes, the park is definitely worth a visit (you will have a couple of hours at Krka if you choose). After returning to the seaside, visit Trogir, a petite island bridged to the mainland. A showcase of stunning architecture founded upon Greek and Roman heritage, Trogir is protected by UNESCO, just like the Cathedral of St. James at your next stop, Šibenik. Rolling down the hillslopes towered by the immense fortress of St. Michael, Šibenik is a sight to behold from every perspective. An optional walking tour will introduce you to Šibenik’s great claim to Renaissance – both the one centuries ago, when the town’s Cathedral of St. James, and the present day, when the town known as one of Croatia’s upcoming gems. Experience its stone alleys and great cuisine in an evening on own. Overnight in Šibenik. 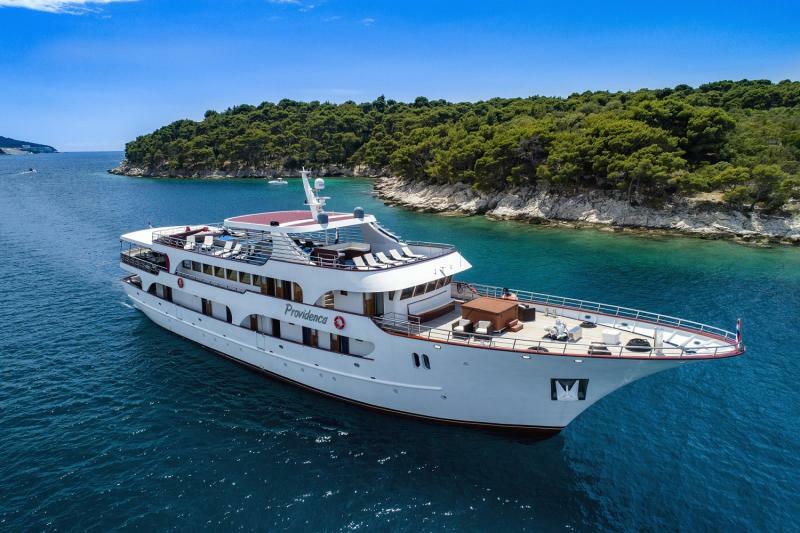 Enjoy the stunning waterfront of Šibenik as you navigate down the narrow channel of St. Anthony out to the open seas. Today you will sail to the island of Vis. You’ll recognize its main settlement, the town of Vis, by numerous masts crisscrossed over the image of its seafront facades. Comprised of the newer, 19th-century harbor area, and the historic, medieval corner, the past of Vis spans over two millennia, hence the colorful array of heritage in this small settlement ranges from a Greek cemetery and Roman baths to an English fort and Yugoslav militia tributes. Join an optional guided tour to get insight into the tumultuous history of Vis and getting some ideas on what to do that very evening. Overnight in Vis.
. Then, hop over to Korčula Island, one of the largest islands in the Adriatic, known for its signature lush dark forests. You’ll know Korčula was a Venetian stronghold as soon as you lay your eyes on the many lion statues which lurk at you from the town’s facades and gates, intertwined with some of the most outstanding stonework you will get see anywhere on the Adriatic coast. The alleged home of the world renowned traveler Marco Polo is bound to charm you whether you explore it on your own or in an optional walking tour*. Overnight in Korčula. highlights all these treasures, but you can also just relax in Slano, where we are docked overnight. of Dubrovnik Old Town takes you by the world-famous landmarks, strolling down the same streets that the cast and crews of the Game of Thrones, Star Wars and Robin Hood walked. Whatever you might consider to be the town’s main drawcard, Dubrovnik’s city walls and its courteous spirit will swiftly transport you back in time to when this was an independent republic which successfully rivaled the Venetian Republic. Enjoy an evening of romance, glitz and glam, as you will be staying in Dubrovnik overnight. Captain reserves the right to change the route in case of bad weather conditions. Guests are obliged to follow ship rules (found in written form on the ship) especially with regards to bringing drinks on board. In case of inappropriate behaviour Captain reserves the right in requesting clients to disembark. Cruise is not suited for young children or persons with limited mobility.